Use all or some of the ingredients listed and /or add other vegetables at hand. This broth is flavoursome and does not need any seasoning. Scrub the roots and cut into chunks. Wash the vegetable stalks and leaves and the peppers. Chop roughly. 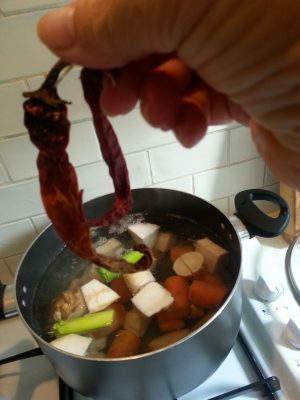 Place the roots in a large pot with plenty of water and bring to the boil on low heat. Cook for 30 minutes. Add leek, greens, stalks, peppers and chilies and cook for a further 30 to 60 minutes. Strain the broth in a bowl and discard the vegetables. Refrigerate and drink a glass at a time over the next two days. 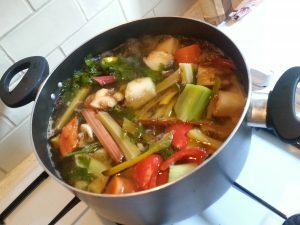 If liked use this broth in cooking - it makes an excellent stock.